I figured if I hold tight to the claim NATIONAL SMART SEPTIC WEEK, then that means I can post about septic related topics Monday through Friday, right? So next on my list is the subject of TOILET PAPER. Seriously? The wrong toilet paper? Is there such a thing? 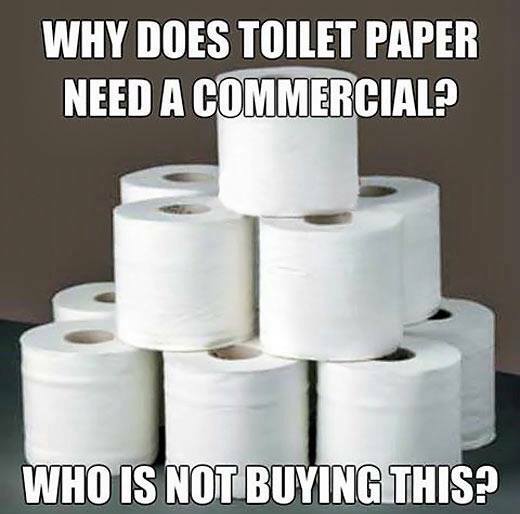 Toilet paper that is strong, soft, quilted, extra ply, typically expensive, etc is not good on your system. This type of toilet paper maintains its integrity in your sewer line. It doesn’t break down into tiny pieces very fast so as it’s making its swirly-whirly-slip-and-sliding-trip down to your tank, it can get caught. Then the next time you flush some more of this super duper paper, it latches itself onto it’s previously flushed friend. Over time, they form themselves a nice toilet-paper-chain-gang AKA a clog. This can happen in your line or also in the baffle area which is right before items drain into your tank. No matter how or where it forms, this toilet paper clog can cause a back-up into your house which is NEVER GOOD! Now, say you use toilet paper that is of lesser ply, not quilted, possibly not as soft and typically cheaper…what happens to it when it hits the water? It breaks down (almost immediately) into tiny pieces that then easily flow down your drain, through your sewer line and into your tank. No obstructions. No toilet-paper-chain-gangs. But most importantly, no back ups! So what if you’re reading this article now and you’re wondering, “do I have septic safe toilet paper?” There is a simple test you can do at home and find out for yourself! Take about 5-8 squares of toilet paper and put them in a small container of water. Shake it up and down a few times. Then open your container and see what the toilet paper looks like. Did it maintain it’s shape? Or did it break down into pieces that don’t want to stay together? If it looks like the latter, you’re good. If not, you’ve probably been lucky you haven’t had any clogs. I wish I could tell you to just go and buy a particular brand of toilet paper and you’ll be safe. However, most manufacturers are constantly changing their paper and again (as I mentioned before) they all claim to be “septic safe.” So in order to play it safe in the toilet-paper-purchasing world, there’s two rules of thumb…depending on how you want to remember it 1) The cheaper and lesser ply toilet paper is best or 2) The better it feels, the worse it is on your system! You take your pick! To see this TOILET PAPER TEST in action, click on this link. It’s two minutes of your life you won’t get back, but you can visually see what I’m referring to about “toilet paper break down” The jar labeled C is the best version of break down! Until tomorrow my friends! I’m sure you’re giddy with excitement about what septic-related topic we can talk about next!